I have always been really active and my first love was dance. I began dancing as a child and this continued as an adult doing a dance degree and then working in dance. Initially performing in a dance in education company, into community dance, Dance Officer with the local authority and finally 18 years teaching A level dance in a sixth form college. Throughout this time I have always taught Pilates alongside a variety of dance techniques and choreography. A few years ago my back suddenly gave in after years of dance and I found myself being drawn more and more to Pilates. I finally give up my job at the college and became a full-time self-employed Pilates tutor and I have never looked back! 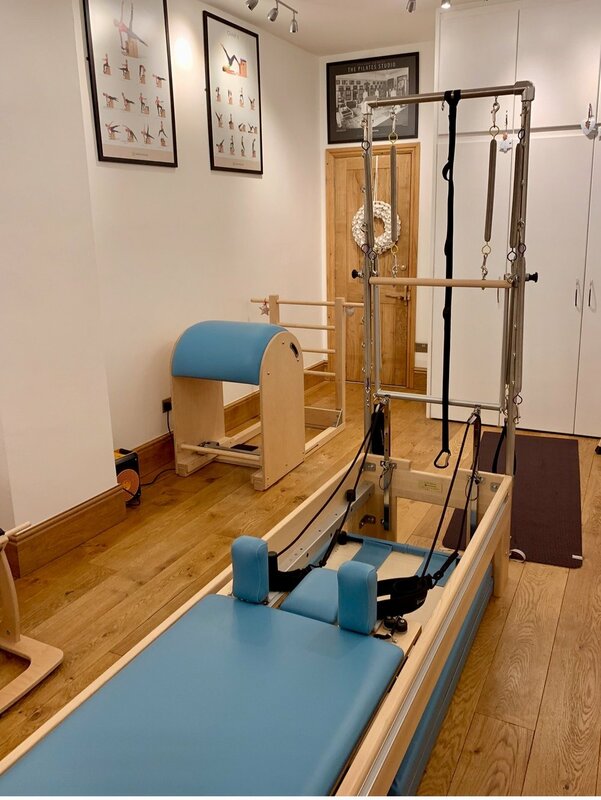 With my background being in dance I really wanted good posture (a readiness to move safely and effectively) to be a feature of my company, hence the name – Perfect Posture Pilates! It completely depends on the group and their needs, although technique and flow is always key. I love devising classes where one move flows beautifully into the next creating an organic progression. I would describe my teaching style as chameleon-like, it’s their class not mine so I really need to address their needs. I just want them to feel fabulous at the end of the session and feel as if they are all getting what they want out of it. I have the most wonderful clients and love seeing them progress and enjoy. You have recently began your Masters Certificate and have expanded your studio to include the large equipment- what encouraged you to do this and how is it going? Part of the training in my dance degree was Pilates, this included classes on the studio’s large equipment which I adored. After completing my training, I returned home and was lucky enough to find dance work, sadly it is in a part of the country which at that time had very few Pilates classes and certainly none on the larger equipment. When I decided to move into teaching Pilates full time (nearly 30 years later!) I was in a position to renovate part of my home to house the larger equipment. It feels like a dream come true! After a break of thirty years it was clear I most definitely would need to re-train in each of the pieces of equipment, I could barely remember what the kit looked like never mind what you do on it. Where else would I go but J Pilates the best! Have adored the training and loving introducing the equipment to my lovely clients, one of the best decisions I have made. I stumbled upon Jo and JPilates on the internet in 2017 where I saw the convention being advertised, it looked like such an amazing mix and packed day I booked on. Gosh it exceeding my expectations and I have continued my on-going CPD with Jo since then. I think I am gradually working my way through her program. Each course always delivers much more than you hope for, I love how Jo can go off on a tangent and another nougat of information is shared! Always great fun and super informative. Is there a piece of apparatus that you like the most and why? Personally, I adore the ladder barrel for my own body. After working in dance for 30 years the cartilage in my lumber spine is now very thin, my lower back can get a bit stiff and grumpy. After 15 mins on this piece of kit my back feels fantastic! Thank you to Jo for providing me with a homecare program to achieve this. What is your client base like? I am so lucky to have a real mix of clients who are all absolutely gorgeous! Recently I have begun to stream my group mat classes, so have classes to cater for equestrians, runners, beginners’ classes including classes specifically for those who tend to have a few aches and pains, intermediate and progressive. I also enjoy teaching Pilates on the barre where I can fuse my love of ballet with Pilates, sheer heaven! I love planning classes with the individuals in it in mind. Lots of planning but it never becomes boring! I also run 1-1 classes in both mat and large equipment Pilates. Do you prefer 121 or group? Why? Gosh, hard question. I love, love, love the energy and giggles you can get in the group classes but equally love 1-1’s where you really get to know your client’s bodies in focused sessions and can correct to a greater extent and look at the detail. Overall, I think I just love seeing how they all progress and our shared passion for Pilates! What is your most favourite move and why? I think I must be a bit fickle because this changes all of the time. At the moment I love the roll over as my back feels so released after it. In the classes where I include roll overs my clients love it, it feels like being a kid again taking your feet over your head it leaves your body feel great too, a real feel good factor. I also love how this can be progressed into control balance and jack knife and so on; a great one to add an extra challenge for those who want it. The Saw, I find it a little rigid, I probably need to practice this more to find the fluidity in the movement. What do you find most challenging about your work and how do you overcome this? Knowing when to stop and take a break. Last year I did 6 days a week for 6 months without a holiday, I didn’t realise I was tired until I stopped. My New Year Resolution is to block out time in my diary! Difficulty is, as Pilates tutors, we are so lucky to work in this field it often doesn’t feel like work but we need to look after our bodies too. What is the most rewarding aspect of being a Pilates instructor? The fabulous ladies and gents who come to the classes, I have the loveliest clients ever, they make my job a sheer delight. How many people can say their job is fundamentally about making others feel good about themselves. My classes are in a small village in North Lincolnshire and I have a loyal client base, it has become a real community hub. 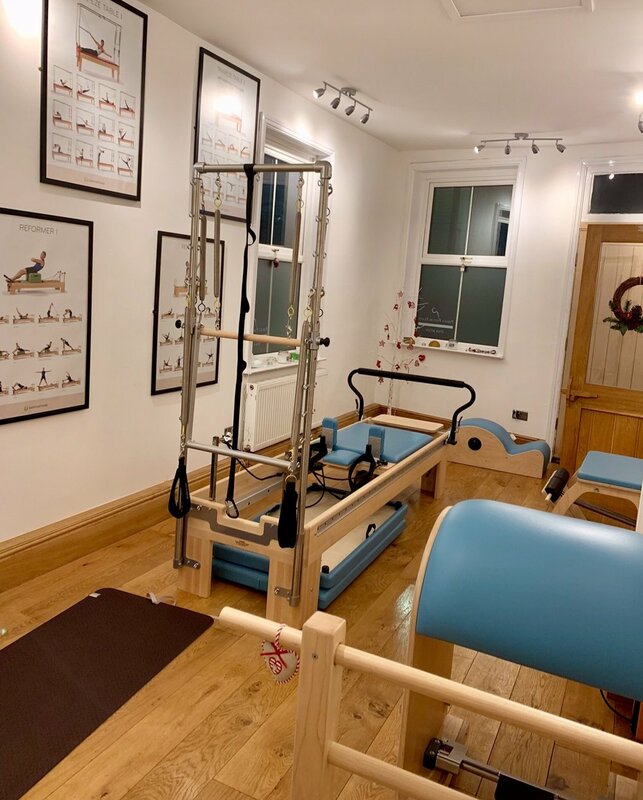 Many of my clients have expressed how through Pilates they know so many more people in this and surrounding villages, and have made great new friends. In response to this I have created a reception/chill out room for them to meet pre and post classes, to have a drink and a natter. Love how Pilates can be about so much more than the exercises, Contrology is the way to go! A friend and I run two one day retreats year. We would like to develop this into a weekend and then into a retreat abroad. Crucially though I would like to gain lots more knowledge! Each time I go on a training course with the fabi Jo Cobbe I come away with so much more knowledge in Pilates but equally being aware that I am still only scratching the surface. I love how there is always so much more to learn. I want to continue to develop and fine tune skills to share with my super ladies and gents. The business has grown really quickly and organically. I now need to build time into my diary so I can really consider where I want to take it, to have time to consider what would be great for the people who come to my classes and begin to implement a plan to bring this to fruition. If you could give one piece of advice to a new instructor what would it be? As a teacher be true to yourself, don’t try to emulate a tutor you admire, learn from them but deliver in a style you feel comfortable in. Be aware of your clients needs, if you invest time and care in them, they will invest in you by continuing to book onto your classes. Keep developing, on-going training is crucial this keeps you and your teaching fresh, updated and invigorated. Most importantly be excited by what you do, enjoy this wonderful career!